The 2017 Sharing Our Stories: Hear Our Voices annual report focuses on who we are, what we do and on the volunteer members of the NOND Board of Directors who are also donors. The majority of board members are nurses with disabilities, and with other Directors keep the operational and programmatic initiatives of the organization on target. 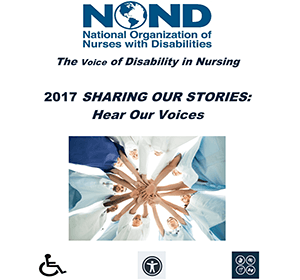 While utilizing some of NOND Directors’ stories as examples, information is provided in this report about what nurses with disabilities experience as barriers, and what they have achieved. View the NOND 2017 Annual Report by clicking on the button below.